1. Being my own stylist for a photo shoot. 2. Learning how to use my camera to its fullest extent. I love styling photo shoots. It infuriates me when I look at photos and see details that were overlooked during the photography session. I wanted to create instances that I could hone my skills and eye for styling, that were more formal, more elaborate, and more visual than my day to day blog posts. As for the second point: I love doing my Photo Walks, but those are mostly centered around outdoor photos because they involve getting to know my new city better. I thought if I could create my own shoots that I could style, I’d be able to have more practice with interior photography. I pitched the idea to my blogging buddy, Ginny, of redlovinpixie, who loved it and agreed to take part in the challenge with me! I was more than happy to do this on my own, but it’ll be so much more fun to have her involved as it’ll be fun to see how we both perceive the same subjects. Having said that, anyone is welcome to participate in this challenge with us. The more, the merrier! 1. No editing can be done to the photo other than edge cropping. 2. Camera equipment and tools of any variety may be used to assist in the photography. 3. Select 1-5 of your best photos, of the same subject matter, to be blogged. 4. The same concept must be blogged at the same time by all participants. 5. The only text acceptable for each photo is your watermark. 6. 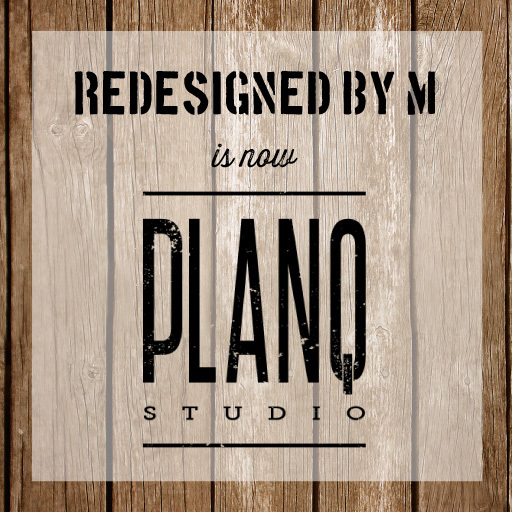 All shoots must be newly styled as of the first Monday of June 2013. Once a month, on the first Monday. *All concepts are open to interpretation of the photographer. We have this month to think of ideas for our first concept and then we post our first photo shoot on July 1st! We’re both very excited about this new challenge and hope you will be, too. If you choose to participate, please let us know in the comment below so we’ll be sure to include your blog in the first post. Do you see it? 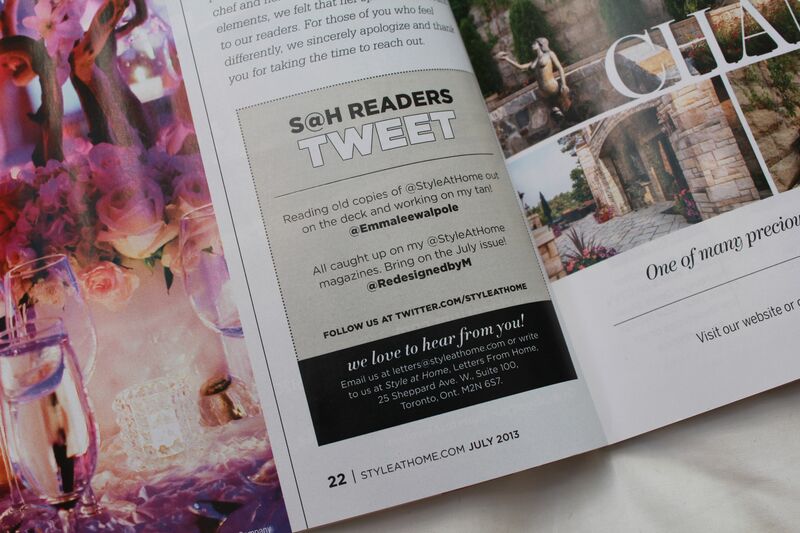 My tweet to Style at Home magazine (a leading Canadian home decor magazine) was posted in their July issue! I literally blinked several times to make sure I read it right. I never in a million years dreamed that this tweet would get published, so I’m absolutely over the moon! Thank you, S@H! Count me in! I so need to learn to take better photos. A challenge might help!! Hi.. u have a lovely blog here. I would love to participate in your photography challenge…. am i late for this month’s “Food” theme? Can i still send in my entries? Please revert. Hi Namrata! We would love you to join us! You’re still welcome to submit this month’s challenge. Let me know when you’ve got it posted so I can link your post. Have fun! ~M. Thank you. I appreciate your prompt response. Could you please specify what does “editing” mean… does it include highlight and fill light( in picasa). Yes, that’s what editing includes. No touching up of the photos except for cropping the edges. Any other questions, don’t hesitate to ask! ~M. Hi again. I’ve posted my entry for the challenge. You could link it up now n let me know what you think of my pictures. Thank you. Wow! You work fast! Will have a look. Thanks! ~M. Hi…I would like to participate…just wanted to know how to link the post. That’s awesome! You would stage the setting according to the theme, style it the way you think best, photograph it, then post 1-5 of your best images on your blog. When you’ve got that, then you link up all the participating blogs to your blog and we do the same for you in return. Does that make sense? When did you want to start? This month (wall vignette) or next month (morning)? Hello! This looks awesome. Is it too late to join in? No, not at all! We’re busy preparing our shoots for November’s theme, “Bedroom.” Wanna start then? Awesome! Some of us (and by “us”, I mean me) are thinking of staging a bedroom setting in another room for better lighting or because our own bedrooms aren’t quite ready to be photographed yet. haha. Are you on FB? I’ll add you to our FB group to make it official. Welcome! Oh, and I couldn’t find your contact info on your blog, so could you give me your email address, too? Thanks! ~M. Well, I just moved into this place…so things are finally “put together”. I don’t think I could mentally stand taking the bedroom apart again! I hope I have done all things right. Please check and let me know. And if haven’t done something right let me know about that too. Thanks! Hi Supriti! Awesome submission! Did you want to join the challenge permanently or was this a one time thing? I’ll be heading over to your site shortly with some comments! ~M. Stumbled upon this challenge by chance – Well, destiny I say. I am learning about photography and its a subject of great interest to me – along with cooking food. Would love to be a part of this challenge from the coming month onwards. Hope I am not too late. Not at all! Would love to have you join us. What’s your email address so I can add you to our Facebook group? ~M. I am excited to be a part this month. I just read the rules. One question that I have in my mind is that : do the pics have to be taken from a professional camera? I am clicking with my smart phone all the time. This time, I captured some ocean and resort pics for the theme while on vacation but was unaware of the tool and camera concept. Also, do I have to style my pictures? Can I submit them in natural shades? Hi Sonal! You can use any camera you want. The idea of the challenge IS to style/stage your photos, but I don’t think a lot of the participants really understand that. If you’ve noticed, I’ve created a scene for every one of the past themes, so that was kind of what I was looking for when I created this challenge. One thing is that absolutely no photo editing is allowed… so no color editiing, if that was what you were asking. Hope that answers your questions! ~M. Thanks M. I have clicked some pictures which were natural in staging but tried to click with an artificial angle. I got your point and will keep that in mind. I will post the pics raw :). Cool. Just to be clear, cropping is totally OK! Can’t wait to see your first set of photos!